Basic nylon waterproof chaps for Hunting, Equestrian, horse or mule trail riding, ATV's, Truckers, Hikers and Birders and all other folks who want to stay clean and dry! Easy on belt attachment system, and non seperating full length YKK zipper. Free stuff sack included. 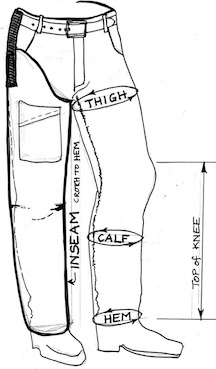 Custom fit using your inseam and thigh circumfrence. Custom colors and many great options! VISA, Discover, AMEX, PayPal and MasterCard welcomed. For more product information and pictures, please visit our website Home Page by clicking above Custom BUILT for You in Colorado!